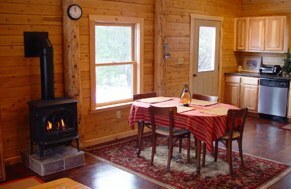 Beautiful Adirondack cabin rental . . . Cozy . . . Peaceful . 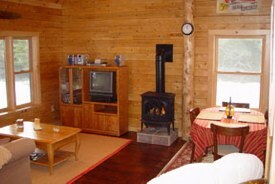 . .
Our Adirondack vacation Whiteface Mountain Skiing or Ski Titus cabin rental centrally located to Wilmington or Malone New York, is among the best Adirondack vacation rentals available for your next ski vacation near whiteface ski resort. 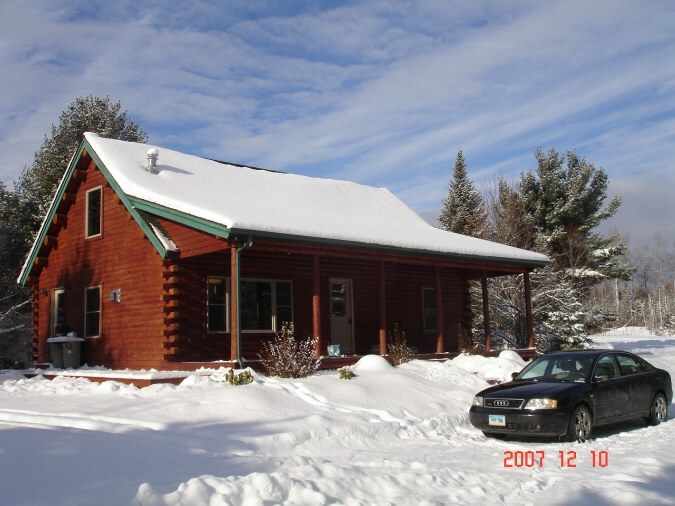 This vacation rental cabin will provide the perfect atmosphere for a summer getaway, winter getaway or a romantic retreat, a snow mobile Adirondack, cross country Adirondack or ski adirondack adventure vacation. 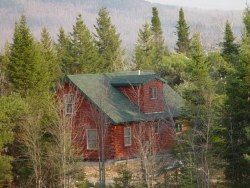 This secluded Adirondack lodging is centrally located to Whiteface Mountain (22 minutes) allowing a great ski vacation spot or fun trip to Lake Placid or a day trip to Montreal. 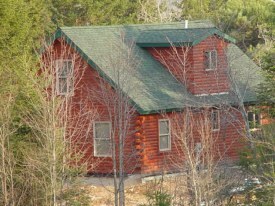 Secluded yet centrally located in Saranac. 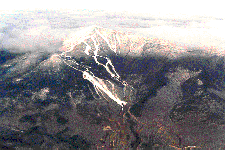 25 minutes to Whiteface, 30 minutes to Plattsburgh, 30 minutes to Lake Placid, 1 hour and 20 minutes to Montreal. 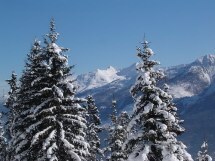 Mountain views to the North. Over looking Saranac River Valley. Nearby access to Adirondacks snowmobile trails. Guides available on request. 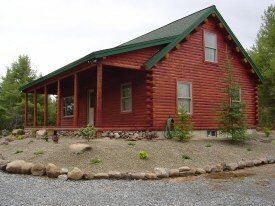 Log home is apart of a 105 ac subdivision that even has it's own private paved airstrip. 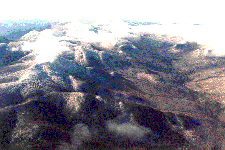 time and enjoy the endless beauty of Adirondack Airpark Estates 105ac secluded grounds. with tall pines and apple trees. Furnished and ready to move into. with well planned efficient space. Perhaps the appearance of the porch with its dramatic covering catches the eye first. 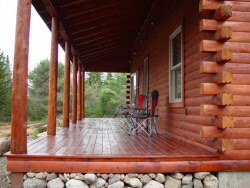 This specialty porch sends out an invitation to pull up a rocking chair and savor the mountain views. The 36' X 8' covered cedar porch is meant to be used all year round. Enjoy the 6' X 24' back porch with it's warm southern exposure. The Langley offers a large 24' x 20' cathedral great room and open floor plan with three bedrooms and two full baths. Skylights, ceiling fans and a gas fired stove high-light the ambience of the northern white cedar D shaped logs and interior walls of knotty pine. Built with high ceilings project a spacious, open area for multi use purposes. 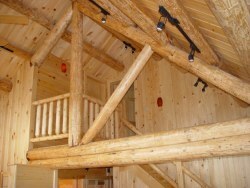 Round purlins and trusses provide a cozy charm in this particular interior. Finished with hickory kitchen cabinets, granite countertops and stainless steel appliances and under counter stainless sink. 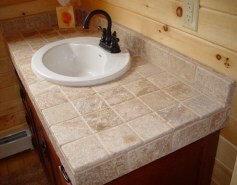 Bathrooms with Mahogany vanity and exquisite granite and marble tile work. There is a workshop in the full basement and a washer and dryer. The warmth of this home wraps its visitors in comfort. Monthly and Seasonal Available. Call us! Contact us with your rental needs. A deposit required for bookings. So call now, we're booking fast. 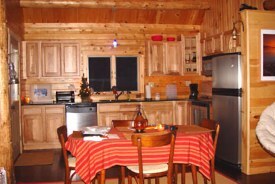 Come and enjoy one of the best Adirondack vacations ever. To have a great vacation you're only required to bring your personal belongings, skis, snowmobiles, a good book, a fishing pole, and a smile. 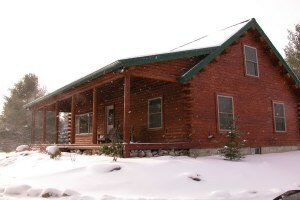 Scenic views, gas fireplace, fully equipped kitchen, covered and uncovered deck, washer/dryer, telephone, television, DVD player, DVD movies, stereo, CD player, VCR. Full basement. 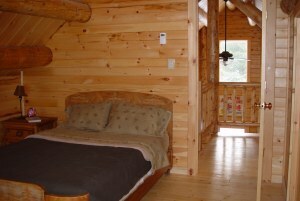 Bruce, we want to thank you for the great stay we had at your log home. It really turned out fantastic! 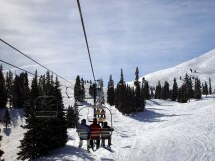 We enjoyed skiing and snowboarding at both Titus and Whiteface Mountains. Our visit to the historic city of Montreal was worth the ride. 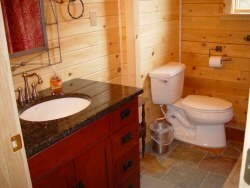 And the log home... what can I say... it left me speechless the moment I walked in. The only thing that was missing was a horse for a sleigh ride in the snow! 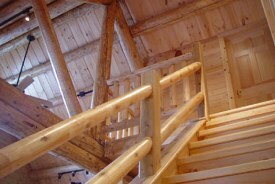 The Builder and Owners of this Log Home are Entertainers. Book Amazing Entertainment at Your Next Event.